This lesson provides an overview of basic weather processes, beginning with how the distribution of incoming solar energy helps to establish Earth’s atmospheric circulations. Learners will gain an understanding of the differences between weather and climate, and how Earth’s winds tend to have dominant patterns determined by region. An introduction to atmospheric stability, clouds, precipitation processes, and thunderstorm characteristics is also included, along with an introduction to weather impacts affecting aviation operations. I thoroughly enjoyed it and thought it really good. I was unsure whether to repeat it and the quiz to improve my score or go straight onto the next lesson. well, now i am learned some basics meteorological lesson but i'm not really satisfied and want to keep moving on to see other basic topics on that site, anyway it is my first time to try that site and think its very good.thanks. Well laid out. Could use interactive training instead of reading with animation. Very interesting course I learned a lot about weather. It seemed a little advanced to be a 101 course, while leaving out basics such as barometric pressure. This lesson is really helpful in my research field. I have learned a lot. Even this lesson tackles about the basic weather processes, it widened the knowledge I have in weather. The question involving the pictures of the clouds was ridiculously confusing and it took me multiple attempts to get it correct. I need better images of clouds if I am going to classify them correctly. Pretty hard to do all at once because there is a lot of information in a boring format. That said, it is simple and easy to understand! This is a great course for those just starting out and for a refresher for those that have been in the Weather Career Field for some time. Would definitely be helpful to see what I got wrong so that I can review why it's wrong. It is very important to know the basic of the weather processes for our daily usages and needs. I am an early childhood teacher in a blended and inclusive prekindergarten classroom. I teach many general topics, and read lots of books to the class as part of our lesson plans. I have been looking for ways to improve my personal knowledge and understanding of many topics, including weather. Through your Basic Weather Processes, I feel more confident in my own understanding of weather and weather related terminology, and thus better able to teach my 3 to 5 year old students. Although we won't go into such details, I feel that it is important for me to understand what I am teaching, so I can better explain and simplify those explanations for the children I teach. Thank you for providing a training that allows me to do just that. As I continue to go through the courses, I find it very useful to my present career. I hope to see this course extended to the synoptic observers at the site stations throughout the FSM. Good overview. Best if intro to atmosphere and intro to oceans are taken first. I learned a lot and as I think videos would help. It was a bit much for me as I have no background in this but glad I did this. A good aproach to basic weather. Review some forgotten issues and learned another ones! Very good lesson for anyone wanting to increase their knowledge of weather and climate. Sometimes the information can be a bit confusing because some subjects are treated shallowly. Perhaps such subjects should be expanded. I thought this lesson contained particularly interesting information that more people should know about. I believe this lesson is relevant to my work and studies. Great course to learn the fundamentals. Very well informed lesson. I liked the cloud cover content especially and I've gained a better understanding on weather and climate differences. Very good introduction to climate and weather. review questions would be helpful. It is an interesting course,quite educative and interesting,and i will take upon myself shearing the knowledge gain with others. this lesson is very useful, not only to those who want to become a meteorologist, but the students who might want to explore the beautiful the weather is. amazing! A very basic but a must pre-requisite to higher understanding of the more advance Weather Process. Needed a few more examples to understand some things, such as the different types of clouds and thunderstorms. This modules really help me understand the weather phenomenon. Very new to this topic; learning. More video explanations would be an enhancement. More practice questions, more interactive training in general would help. Very informative information & is not filled with information overload, gets to the point of things and easy to understand. 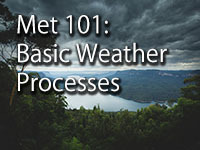 Great introduction to the basics of weather processes. Encourages to read more around topics that you may want to know more about. Really good learning tool very informative. Lots of good information. This is a great lesson and it is easy to follow and understand. I recommend it to anyone in meteorology or interested in weather at all. Learned alot on cloud formations would recoomend this course . May be difficult for those with no understanding whatsoever of weather/climate, otherwise very informative at a basic level! Interesting and very informative lesson on what drives our weather and climate. This program was a great refresher for weather basics and helped refresh areas I had forgotten. It is a good lesson for update and remember the study in the school. This was my first lesson and quiz from this site and I would highly recommend it to any weather enthusiast out there. No knowledge of terminology other than what I've seen on the nightly weather reports and NOAA on line. Much more to it and for a first lesson a little too much. I thought it would be more technical than it was, and helped to synthesize some different pieces of weather phenomena together for me! An easy, short read, would recommend to the novice. A lot of information to digest. Some of it could be rewritten to be a bit more understandable to a novice. The lesson was an overall interesting and informative one. Very interesting lesson done in an effective and interesting format. Recommend it to anyone with an interest in learning about how our planet works! I know they were trying to cover a lot of processes in a short amount of time, but it felt like some details were lacking or unclear. For the most part, it is a great overview, but I wish the Bergeron process was slightly better explained. What may be more important than that for general understanding would be to link some of the circulation stuff into the monsoons a touch better. As it is, a lot of this is a touch scattered and each topic kind of a standalone tidbit, rather than forming a general picture of atmospheric processes as I had hoped originally. I would still recommend as perhaps a review of some of this for those taking an intro to meteorology course, or an earth sciences course. Some with no background will do OK with it, others may struggle a touch. The presentation of this lecture is very clear and comprehensive. However, I recommend that the temperature range for the precipitation simulation (http://profhorn.meteor.wisc.edu/wxwise/precip/h5/preciptype.html) should be increased from +5degree centigrades to about +27degree centigrades to allow users better understand precipitation processes and types in the tropics. Thank you. I think it was good for a beginning course on weather. Definitely helpful tool to learn! With not knowing anything about what was in this lesson. It did help me to understand more. I can't wait to learn more. I want to know.